I originally wrote this story for Edible Toronto Magazine. There was a time when Paul Sawtell had an affinity for shiny, expensive items. Such objects still occasionally catch the former pharmaceutical sales rep’s eye. He gets excited, for instance, when he sees a newly washed delivery truck sparkling in the sunlight behind the warehouse of 100km Foods. These days he prefers his flash with substance – the kind that comes from trading a career with lucrative financial rewards for one rich in social benefits. 100km Foods Inc. is a wholesale and distribution business bridging the gap between farmers and chefs and getting more local food onto our plates in the process. Beamsville farmer Torrie Warner sells his fruit through 100KM Foods. Those who knew Sawtell earlier in life might find that surprising. As a kid, and even into adulthood, he eschewed vegetables despite his parents’ pleas at the dinner table. These days, he’s the guy most likely to one-up everyone else with his vegetable intake. It was less of a stretch for Mandarano, who also worked for a pharmaceutical company before forgoing the business of medicine produced in a lab for that grown on a farm in the form of carrots, chard, and apples. Her Italian family has strong connections to the land. Growing up in southern Italy, Mandarano was more likely to eat food – plants and animals alike – grown by relatives rather than purchased at a store. Still, the two were on track in their early twenties for successful careers with big pharma. Financial stability, and all those shiny, expensive trappings it promised, weren’t a dream; it was the reality on which they were embarking. The problem was that what their careers offered in largesse, they lacked in one of the greatest jobs perks of all: satisfaction. In 2007, Sawtell and Mandarano had a “crisis of consciousness in their jobs” so they packed their bankers’ boxes and quit. Soon after, they packed their suitcases and travelled to Asia, where they spent seven months figuring out their next step. Each day away from the security of their jobs back home in Toronto, they became more certain that there was no going back to corporate life. They were just uncertain as to what they’d do instead. They scheduled meetings with big-city chefs, starting with Anthony Walsh, who was steering the kitchen at Canoe, Oliver & Bonacini’s flagship restaurant. 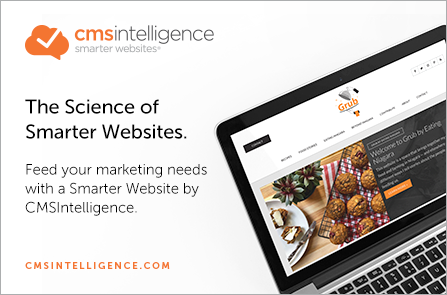 They fielded their idea of a local-food scouting-and-delivery business and fine-tuned it based on the needs of their potential customers. The following April, they made their first delivery. “Much to their surprise, we had a truck and registered business and called them back and said, ‘We’re ready,’” Sawtell remembered. He and Mandarano took chefs’ orders on Thursdays, manually collated them over the weekend, made their purchases from farmers on Mondays, and delivered to restaurants on Tuesdays. It would be eighteen months before they could write themselves a paycheque; it was meagre, but their business was growing slowly and steadily. “If we were selling widgets, we would have quit,” Sawtell said during a quiet moment in the action at the 100km Foods warehouse in North York, “but this was something we really believed in.” Almost nine years later, they’ve clocked more than forty thousand deliveries and they’re writing paycheques for a staff of twenty-five. The company’s roster of producers has grown to eighty and the number of chefs tapping in has ballooned to three hundred fifty. They now have ten delivery trucks and there’s a steady rhythm of produce in and produce out at their half of a Colville Avenue warehouse that the business has nearly outgrown. To limit waste, what doesn’t sell gets divided among staff or shared with food rescue program Second Harvest. As a benefit corporation (B Corp), which is a for-profit business that emphasizes positive impact, 100km Foods also helps The Stop Community Food Centre by transporting produce from the social organization’s farm to its Davenport Road headquarters. The company’s efforts to do good has landed it on the 2016 B Corp Best for the World list. Dan and Jeff Tigchelaar from Jordan sell their strawberries through 100KM Foods. More importantly, Sawtell and Mandarano can sleep at night knowing they’re teaching their sons, Jack, 6, and Oscar, 3, solid values and what’s important in life. They had some help along the way. The Friends of the Greenbelt Foundation awarded critical grants to the business. 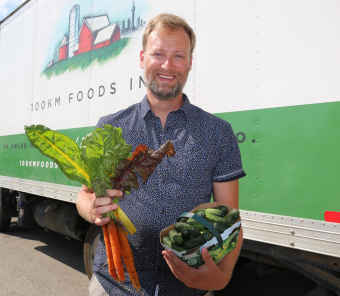 The Local Food Fund helped 100km Foods find its current home, an electrical warehouse retrofitted with refrigeration just south of Highway 401, the artery that carries the lifeblood of their business from farm to table. (And, yes, they do try to stay true to the business name. 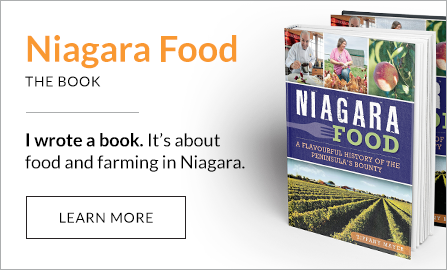 About 95 percent of the produce they source for chefs comes from within 100 kilometres of Toronto.) Over the years, Sawtell and Mandarano have added dairy, eggs, and cured meats to their offerings to help the business through the lean winters. They’ve also created new markets for farmers. Take the chef who wanted green strawberries for pickling, as an example. Sawtell figured he couldn’t be the only one and he was right. Others were also keen to have the unripe berries and suddenly farmers were training their workers to keep an eye out for the immature fruit at just the desired stage. Ultimately it was the couple’s hunger for meaningful work that turned 100km Foods from the fledgling start-up of two tenacious idealists into a critical connection in a food chain where local ingredients are increasingly becoming the standard. Every day, farmers “too big for a farm stand and too little for Sysco” let 100km Foods know what they have available. A list is compiled and sent to chefs, who place their orders by 4:59 a.m. to get their berries, beets, and maple syrup the next day. Drivers head out on four separate farm routes to collect the goods and return them to the warehouse, where orders are prepared overnight and shipped out the next morning. And if a chef wants peaches, 100km Foods won’t merely deliver the fuzzy fruit.